... which is producing a final few buds.. The dusk colours don't last for long ..
Oh Tt thats Gorgeous, The garden has a lovely glow, doesen't it.. I'm so grateful to whoever it was that invented the camera and more especially the digital version. That is absolutely gorgeous TT - good shot! WOW! What a fantastic sunset, I can't remember seeing one in our area as good as this. Do you know, I wondered why my Wisley cream hasn't flowered , I thought it flowered in the spring. thanks for offering to nominate for Sunsets ..
but not a category as far as I know .. I am going to make this my desktop pic TT...what a gorgeous photo....just melts your heart when you see that doesn't it...similar feeling to looking at a sky full of stars...Awesome in the truest sense! Magic TT! Well done for catching it. Really fab photo. Wow! thats absolutely stunning!!!!!!!!!!!! What a beautiful Sunset........ Straight onto my favs. 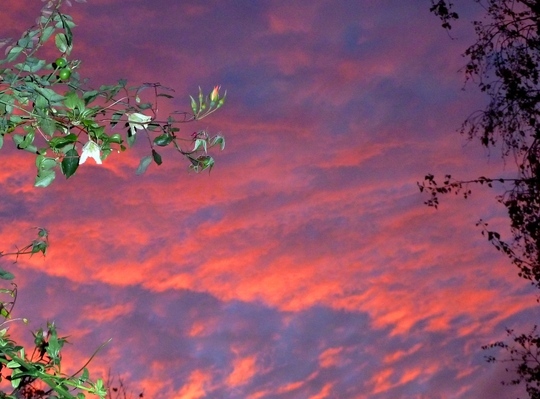 Lovely shot of the sky, We have had some really great sunrises and settings. Thanks Linda... amazing skies this autumn ..
Seen quite a few rainbows too Terra. I have even seen a cloud that must have been at the correct angle to the sun that had part of a rainbow in it. Glad you've put this on your favourites. Amazing sky! It's just beautiful.